W11 Opera might be an ensemble of children and young people (some 70 in total sang in the performance) but Russell Hepplewhite and Helen Eastman’s opera was a big piece dealing with a big subject. 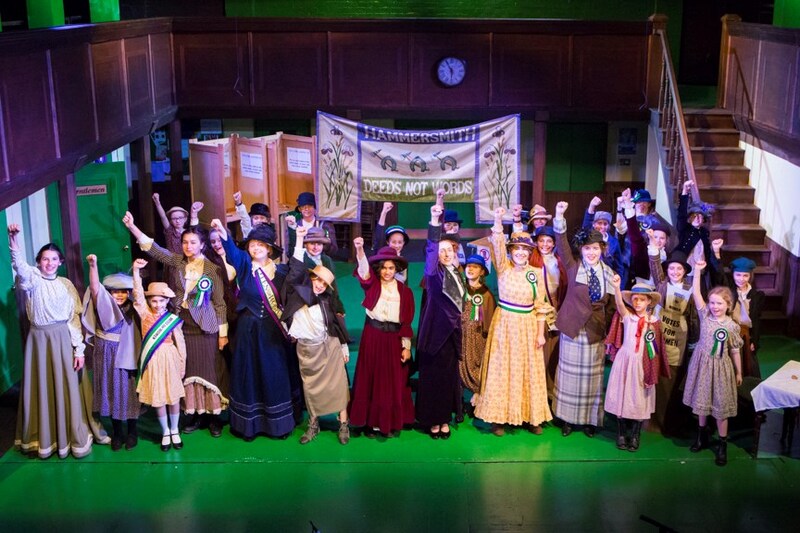 It told the story of the Suffragettes and the fight for Women’s Suffrage. we were gabbed by voting fever as soon as we entered the foyer as we were presented with a ballot form and encouraged to vote. Helen Eastman’s libretto placed the historical narrative in the context of the modern day and the opening scene was a contemporary polling station in a marginal constituency, with various film crews covering the event. Sierz (Ahana Hundal) as Jess and Nora (Izzy Lewitt, Yaiza Freire-Bernat) what they voted and she is incensed that they didn’t, and talk of the luxury of being able to vote brings on the story of the Suffragettes. This framing device (the contemporary polling station returns at the end as Jess and Nora vote), placed the Suffragette struggle in context and enabled Helen Eastman to insert short explanations without becoming two didactic. There was a further historical layer, as punctuation the Suffragette story were scenes of further back story as Richard Pankhurst (Sachin Oberoi), the late husband of Emmeline Pankhurst (Josie Cooper), tries unsuccessfully to get various Women’s Suffrage bills through Parliament. The admirable thing about Eastman’s libretto was that, despite the complex layering of narrative, it was clear what was going on and, with very little extra information, who was whom. The main plot did not pull any punches in taking in the violence of the riots, the arrests, hunger strikes, force feeding, Cat & Mouse Act, smashing windows, all culminating in the death of Emily Wilding Davison (Georgie Redhead) as a result of throwing herself under the King’s horse at the Derby. Russell Hepplewhite’s score was similarly complex and multi-layered. Russell Hepplewhite does write tunes, and gave his numbers an element of toe-tapping swing; the main ‘Votes for Women’ chorus is definitely an ear worm. 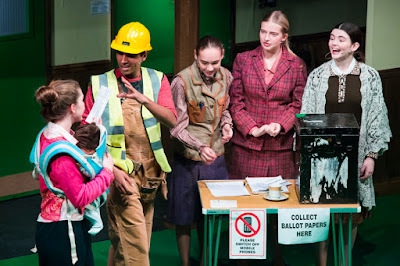 And there were recurring motifs and themes with people such as the paperboy (brilliantly played by Theo Mackenzie), and the ballot box girls (a wonderful Andrews Sisters style turn from Mirim Huseynova, Eloise Kirkby, Indigo Wolf-Garraway) popping up at various points as linkage and punctuation. 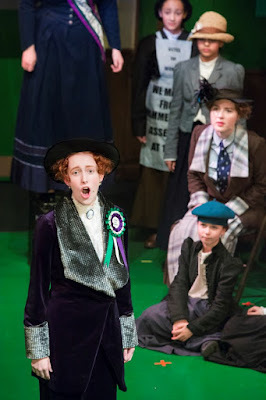 And there was humour too such as the chorus of bobbies, who after their G&S moment promptly turned round and started attacking the marching women, or the tic-tac chorus at the races, a lively and characterful number. Hepplewhite wove all this into a complex whole, layering tunes and ensembles over each other in imaginative fashion, letting ensembles dissolve to give striking solo moments, all articulated with remarkable confidence and deftness. He has a knack of writing music which combines complexity with a toe-tapping element. This is the fourth of Russell Hepplewhite’s shows that I have seen (having seen his three children’s shows for English Touring Opera including the award-winning Laika the Spacedog). The Price had a complexity of conception and structure which made me want to hear him writing for an adult ensemble and adult audience. Central to the show was Josie Cooper’s Emmeline Pankhurst, a strong and powerful performance which give the show heart, supported by Kiana Mottahedan as her daughter Christobel with Julia Kennish as Millicent Fawcett (who preached non-violence), and of course Georgie Redhead as Emily Wilding Davison whose strong identification with the role made the work’s climax very powerful indeed. Conductor Philip Sunderland drew a fine performance from his ensemble of five, accompanying the young voices sympathetically and bringing out some imaginative colours in Hepplewhite’s score. The production was highly imaginative, Neil Irish’s multi-level set did wonderful duty as a variety of locations, and Susan Moore’s production ensured we always knew what was happening. with videos on a screen stage left combining period footage with slogans and animations in imaginative manner. W11 Opera can be proud of is 36th commission, and serendipitously the work’s theme has taken a striking resonance with the political events of the year.